Over a dozen varieties of cosmos plants exist, and each produces a different color flower. Cosmos flowers grow in shades of white, pink, yellow, red, orange, yellow and some flowers contain two colors in one flower. Cosmos are so named because Spanish priests felt the flowers developed into "an orderly arrangement of cosmic proportions." Cosmos plants grow up to 7 feet tall. The leaves are fine and wispy, and are very similar to fern fronds. The stems of the cosmos are round, stiff, and strong. Each flower stem has a single flower. The flowers are open and broad, with evenly spaced, overlapping petals surrounding a small, dark center. Cosmos flowers prefer bright sunlight, but tolerate some shade. For optimum growing, plant cosmos in an area where they receive at least 10 hours of bright sunlight each day. Cosmos tolerate any kind of soil, including poor-quality, rocky soil. Cosmos require very little water, and prefer drought-like conditions. They can survive on the water they receive from infrequent rain showers. Only supplement with watering if there is one full month with no rain. Otherwise, don't water even if the soil is dry. 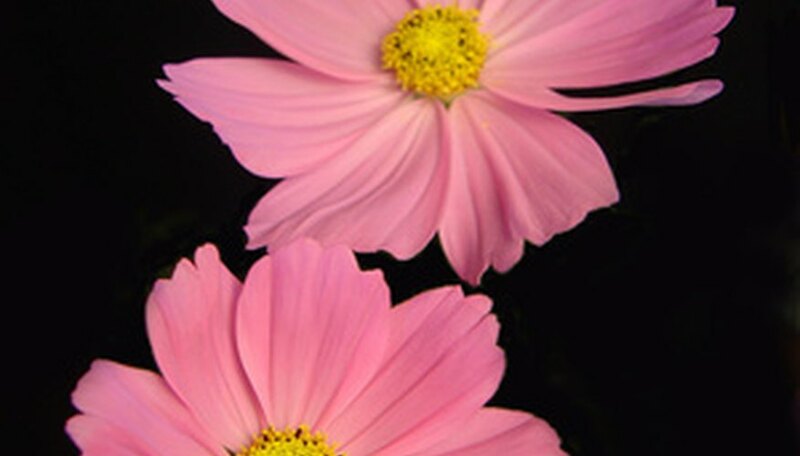 Cosmos are propagated via seeds or division. The large seeds germinate quickly and bolt up to 5 feet in a single growing season. Rhizomes are divided with a sharp knife and planted 5 inches below the soil's surface. Each rhizome develops into a new cosmos plant. Cosmos flowers look like more delicate, more colorful daisies. They are used in floral arrangements of spring wild flowers. They look good alone, or as accent colors in larger arrangements. Dried cosmos flowers are used in crafts projects, for home decor.